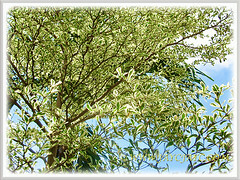 Variegated Madagascar Almond or Dwarf Geometry Tree with its superb variegated leaves will be a lovely addition to any garden. 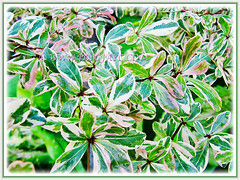 The variegation on the foliage is simply captivating, to say the least. 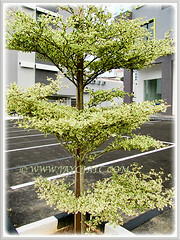 Its tiered branches gives it an architectural look. Hence, this majestic tree is popularly planted along the roadside, residential and urban areas to showcase its beauty and attractiveness. Botanical Name: Bucida buceras cv. 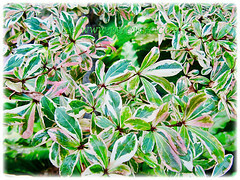 Variegata (syn. : Bucida spinosa, Terminal mantaly cv. Tricolor, Bucida molineti variegated). Common Names: Variegated Madagascar Almond, Dwarf Geometry Tree, Spiny Black Olive, Spiny Bucida, Oxhorn Bucida. Origin: Native to Mexico, Central America, The Caribbean and the northern South America. Features: Bucida buceras cv. 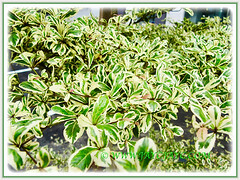 Variegata is from the genus, Bucida that consists of six accepted species. A fast-growing tree that reaches between 10-20 m in height and spread to about 10-15 m wide. Its crown is layered in symmetrical tiers. The simple, unifoliate and variegated leaves are whorled along the stem. Leaves are small, measuring 2-5 cm long and 1 cm wide. It is mottled grey-green with irregular creamy-white border, young leaves pinkish-red, margins uneven to crenate, produced in whorls at branch tips. The twigs grow densely in storeys on whorls around the woody trunk. Its bark is smooth, mottled pale grey, with protuding brownish streaks or spots. Its deep anchoring roots make it able to endure high winds with little damage. It produces bisexual yellow-coloured and insignificant flowers. These flowers will be followed by clusters of tiny, fleshy and inedible brown fruits. Culture (Care): Bucida buceras cv. Variegata or Variegated Madagascar Almond can be easily grown with minimum care. Moisture: Moderate water requirements. Drought tolerant when established. Soil: Best in well-drained, sandy and loamy soils. 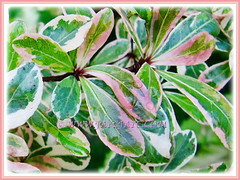 The variegated foliage may revert to pure green leaves of the species form. Hence prune these branches away when they appear. Generally free from serious pests and diseases, but do look out for sooty mould and bark borer. Bucida buckers cv. Variegata or Variegated Madagascar Almond is a tender perennial. Do not expose to freezing weather or temperatures below 4°C. In non-hardy regions, grow it in a tub and bring it to overwinter indoors. You can even plant it as an indoor plant in a greenhouse with sufficient lighting. A tender plant that has been grown successfully as a bonsai plant. Propagation: Best to propagate by softwood stem cuttings or layering. Can be propagated from seeds but very difficult to germinate. Usage: Bucida buceras cv. 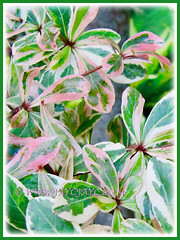 Variegata with its ornamental and variegated foliage will be excellent for parks and along roadsides and streets. 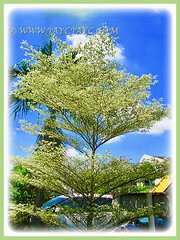 Grow this ornamental tree for its majestic and architectural look. Ideal as a specimen tree. 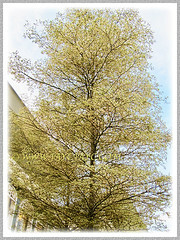 The aesthetic beauty of the large, dense and horizontal spread of it canopy makes it an excellent shade providing tree. Suitable to for container planting. Since its dry wood is termite-resistant, extremely hard and durable, it will be excellent in construction of house posts, fence, scaffolding and bridge timbers. The bark may be used for tanning leather. A popular tree that can be trained as a bonsai specimen. Medicinally, the bark of Bucida spinosa is mixed with the bark of mangrove Rhizophora mangle and processed into a styptic agent to stop bleeding when applied to wounds.